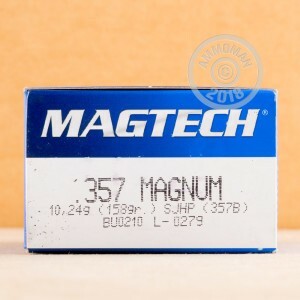 This .357 Magnum ammunition from Magtech is a versatile load suitable for target shooting as well as hunting. These cartridges come in boxes of 50 and fire a heavy 158 grain semi-jacketed hollow point bullet at a muzzle velocity of 1,235 feet per second. The hollow point design, while not as advanced as some self-defense ammo, performs well against midsize targets like coyotes and hogs. Magtech ammunition is loaded in Brazil by CBC, a major defense contractor. CBC produces its own components (including non-corrosive Boxer primers and brass cases) for better quality control. 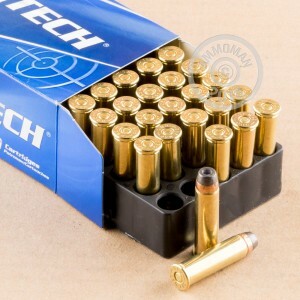 Buy a few boxes of this ammunition and get free shipping, as with all orders over $99 at AmmoMan.com!